Brad McGee OAM gave everything he had on the bike in a 10-year cycling career that made him an Olympic gold medallist, world champion and wearer of all Grand Tour leader’s jerseys. The first Australian rider to lead the general classification of all the Grand Tours in France, Italy and Spain will be inducted into the Sport Australia Hall of Fame at the 33rd Induction and Awards Gala Dinner proudly presented by Etihad Airways on Thursday 12th October 2017 at Palladium at Crown. His performances during the four years leading up to his gold medal winning ride at the 2004 Athens Olympic Games were world-class and included an individual pursuit world title and two Tour de France stage wins. 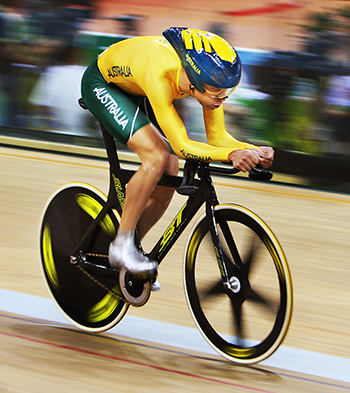 McGee also claimed his fifth Commonwealth Games gold medal in 2002 prior to crossing the line first in the 2003 Tour de France prologue meaning he would wear the iconic yellow jersey for three days. “You’re king for the day, it’s pretty good,” he said after wearing yellow for the first time. Gold in the team pursuit at Athens was coupled with silver behind Brad Wiggins in the individual pursuit following victory at the Giro d’Italia prologue, where he finished eighth overall. Prior to that, the youngest of four McGee brothers who grew up in Sydney, claimed bronze at the 2000 Olympics just 18 days after having his collarbone screwed back together following a bad fall. Gold in the velodrome at Athens was the resounding highlight of his career as McGee understood how special it was for four cyclists to have complete faith in each other and perform on the biggest stage. "The team pursuit gold medal ... we had been trying to win that thing for a long time and it's obviously something you can't do yourself and you need to connect with your mates," he said. "Everything needs to be in-line together and that's a higher level than any individual success you're going to have. "I remember the warm up. We were in this little room under the velodrome and we were only 10-20 minutes away from starting. I took a little look around the room at the guys - (Brett) Lancaster, (Graeme) Brown, (Luke) Roberts and you could tell there and then that we were connected, and we were 'on'. "There was just a high level of trust and respect and a little bit of fear. You're warming up with three blokes who can essentially rip your legs completely to pieces. "But the realisation we were connected and about to go out there and do something pretty special was an awesome feeling." McGee grew up with three older brothers, nicknamed nipper, and his relentless attitude to outwork his opponents on the bike was likely spawned from those early days challenging his siblings. Once he started training hard it was not long before McGee was a world junior champion and he also set an under 19 3000m world record prior to winning a bronze medal at his debut Olympics at Atlanta in 1996. The next season he moved to France with his wife Sharni, going on to set more national records and then signed a professional contract in 1999 with Française des Jeux. Any professional sporting career contains at least a few setbacks but the major low point for McGee was knowing that when he was at his strongest many of the major players were unfairly streaking ahead in the Lance Armstrong years. McGee wrote a strong and honest article in 2012 titled ‘How dopers stole the best of my career’ outlining how the EPO era had significantly affected his career. “It doesn't get any easier to deal with something that deeply concerns you and yet something you have little control over. Once again I am disillusioned. And I ask myself, ‘Could it have been that bad?’” McGee wrote. McGee is extremely honoured by his induction into the Sport Australia Hall of Fame, but has been consciously keeping his cycling mind set on teacher mode as he continues his work as a national coach. "This is a little bit weird because I thought these days were done," McGee said of his induction. "The challenge for me is that I'm in the coaching space so it's all about giving and enabling and working with young athletes. I deliberately stop myself from saying things like, 'when I was a boy', 'In my day' or 'when I did it'. "I've sort of dropped all that." McGee just missed out on the bronze medal in the team pursuit at the 2008 Olympic Games and not long after decided to retire after putting his body through an incredible amount of stress, along with several bad falls, after nearly two decades of competing on the bike. He has been team director with CSC-Saxo Bank team and then worked with top Australian riders such as Richie Porte as the coach of the Australian national road team and New South Wales Institute of Sport. He lives in New South Wales' southern highlands with his wife Sharni and two kids, and is often based in France while fulfilling his coaching duties during the European season. Brad McGee OAM will be inducted into the Sport Australia Hall of Fame on Australian sport’s night of nights – the sold out 33rd Sport Australia Hall of Fame Induction and Awards Gala Dinner – proudly presented by Etihad Airways, on Thursday 12th October at Palladium at Crown, Melbourne. 2017 will mark the 33rd edition of this event, with eight Australian sporting icons, from on and off the field, to be inducted into the Sport Australia Hall of Fame. In addition to the eight inductees one current Member will be elevated to Legend status, becoming the official 39th Legend of Australian Sport.